How do I choose my cart sizes? You can select your cart sizes using the form above. You will also receive information in the mail with instructions on how to choose your cart sizes by telephone or mail. What are my cart options? Each residence will receive three carts: One for landfilled trash, one for recycling and one for compostable yard waste; and each resident may choose the size of cart: 35 gallon, 65 gallon, or 95 gallon. Residents are encouraged to monitor their trash and recycling volume and perform a waste audit prior to cart selection in order to make an informed selection. How do I perform a waste audit? How else can I tell which cart size I need? Please see the graphic below to help determine which size best fits your needs. If you need assistance in determining your cart size, a customer service representative can assist you at 402-346-7800. How many carts can I have? Your base service includes three carts, one for landfilled trash, one for recycling and one for yard waste. You are not required to receive a recycling or yard waste cart, however, these carts are included at no additional fee. You can select any size of cart that fits your waste generation needs. For instance, you may select a 35-gallon landfilled trash cart, a 95-gallon recycling cart and a 65-gallon compostable yard waste cart. Additional carts may be obtained from Papillion Sanitation for a monthly fee of $9.00. Pick your cart, pick your price. 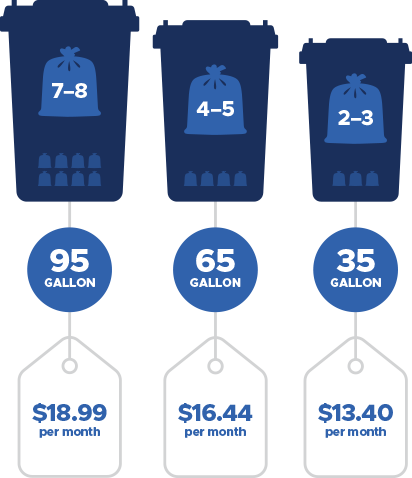 Graphic is based on average tall kitchen bags (13 gallon size) of trash per week.